Black Friday 2014 Sellers Promotions! In case you missed it, we’re now offering free Promotions for our COMC sellers! Check out the Promotions Manager link on your dashboard, and you’ll see several options available! 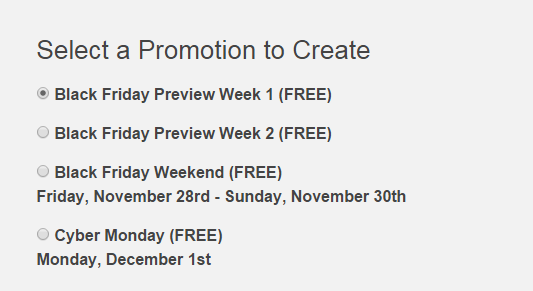 You can run “Preview” sales for the weeks before Black Friday, as well as Black Friday weekend. Or just do a special 1-day Cyber Monday sale! So, head on over the the Promotions Manager page and get your Black Friday sales set up! ← Black Friday Processing Special – Expanded! I hope a lot of traffic comes, that has always been a struggle. Lots of incredible deals on cards, but just sit due to lack of buyers. I just want to clarify, these are Free, meaning no $3 daily fee, and is there no 3% charge on sales? No charge on any of them. This is the biggest perk sellers get on the site. Would have been nice to have been able to send stuff in for the sale at a reasonable cost…but will take the opportunity to unload some inventory via these sales. How are all of you best utilizing this promotion? hello? is this for only cheerleaders? hello?